Data, analytics, insights: the trifecta every digital marketer must have in their toolbox. But numbers are nothing without context, and insights are useless unless transformed into action. How you use data, analytics and insights determine whether your marketing strategy sinks — or swims like Katie Ledecky. This is particularly the case for multi-location brands trying to execute a savvy local marketing strategy on Google. Google has become synonymous with the internet itself: it’s where we go for maps, to see ads, listings and now, even find parking spots. Everything lives on Google in some form or another, and it’s rare to not cross paths with the Mighty Search Engine at least one point during a searching journey. That includes you, your business, your clients, and your potential customers. All in one place. In 2014 (which is almost a century ago in Internet years), Google made the transition from Google+ listings to Google My Business. Google My Business has offered a continual improvement of business displays and subsequent analytics. Multi-location brands might be doing this in-house if there are enough resources and time to go around. Otherwise, Local Marketing providers take care of listings. 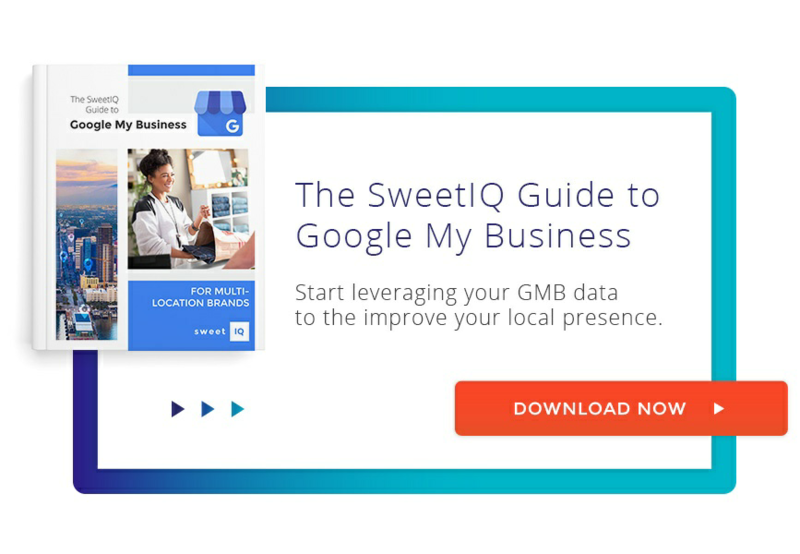 In both cases, business owners should be aware that GMB is, unsurprisingly, not a stagnant entity: it’s constantly evolving, adding new features, and developing more ways for you to harness its data to power local campaigns and execute targeting nearly perfectly. The more data you get, the better insights you make. Data coming from GMB is extremely helpful for precise targeting in your Local Campaigns. It’s useful to see a comparative analysis on how each of your locations is performing, so you can establish benchmarks of success and critically assess each site. The main challenge here is discovering how to extract this data and plug it properly into your local strategy. GMB allows access to these analytics through their API (which they augment more and more frequently now), but this means businesses (especially multi-location ones) need a way to integrate with Google’s API to read and make sense out of the data. The best way to do this is through a dashboard that can extract the information and present it to you in a way that makes sense. While many Local Marketing providers make a big noise out of how integrated they are with the GMB API, the reality is that data is nothing if you can’t take action upon it. More specifically, you need to be able to compare GMB numbers with data coming from Facebook, Bing, Apple Maps, Foursquare, and Yelp. The more comparison points and the more data you get, the more insights you can apply to concrete actions in your local pipeline. With that in mind and with the help of our local experts, we have prepared a pairing between what GMB offers and concrete actions you can take. These insights serve you to allocate resources across locations better and track how marketing activities affect your business. How users are finding your listing: This GMB metric shows how many customers found you via a “Direct” search (they typed the name of your business or your address directly,) versus a “Discovery” search (they searched for a category, product, or service that you offer, and your listing appeared). While this information per se is useful, you need to be able to see a broader picture and tie this to ROI. Did your customers click on one of your ad campaigns? Or, did they land on your website through an organic search, that lead them to a piece of blog content related to your business? Both options are good, but the differentiation is key: if you’re buying ads and you’re converting searchers, then your ads are finding the right eyes. And, if you’re ranking organically for a highly competitive search, that means you have quality, engaging content. What’s most important here is to detect if there’s a significant discrepancy: are searchers finding you at all organically? Or are your keyword campaigns falling flat? If you’re not getting found on Google organically, it might be time to take a deeper look into your SEO strategy. Likewise, you may need to do more keyword research to make sure your ads are being targeted to the right people. Where customers find you on Google: This data point shows you who search for you on Google Search vs on Google Maps. It’s simple at first glance, but there’s more to it than meets the eye. By differentiating between the two, you can follow suit on your paid campaigns. A good trick here is to ask your local provider to connect your AdWords account to your GMB Business account and adding Location Extensions. For example, if you see more traffic coming from your Google Maps you should be including those maps into your ads. You can choose to display these ads on Search Network (targeting people who search for keywords related to your business) or on Display Networks, where your Ads will be shown on sites and apps when people are near your business locations. Knowing the amount of clicks-to-action on a per-location basis allows you correlate certain online actions with actions taken in your stores – a step closer to building your online-to-offline conversion funnel. Comparing this data is vital for multi-location brands to understand trends across their different locations. Driving directions, for example, give you an idea on how many of these searches are converting into visits to your locations. Likewise, if you see the volume of calls is considerably higher at a certain location, you might want to implement a Call Tracking tool to monitor what those calls are about and how your customer service is responding to the high demand. Google is a powerhouse that’s here to stay — so the sooner you develop a sound approach, the sooner you’ll see ROI from your local marketing strategy. Make sure you don’t let your data sit in a silo, and rigorously analyze the insights coming in so you can make smart campaigning decisions.